Home › FAQ › What is the Average Price of Tuition of a Private University? What is the Average Price of Tuition of a Private University? You probably see articles in the paper or specials on television that talk about how the cost of college keeps rising without seeing any statistics or information regarding the average price of tuition at a private university. While you might know that private schools cost more than public schools, you might not realize just how much more those schools cost. In addition to looking at the cost of tuition, you’ll also want to give some thought to all the other costs you face. According to the Institute of Education Services, the average price of tuition at a private university is nearly $34,000 a year at a four-year college and over $23,000 a year at a two-year college. In comparison, the average price per year for a four-year public university is close to $17,000 and less than $9,000 a year at a public two-year college. Tuition refers to only the cost you pay for the classes you take and can vary based on the number of credit hours you take. Students who take more than the standard 15 credit hours per semester will pay more for tuition. If you plan to live on campus at a private university, you should factor in the cost of room and board. Most schools require that freshmen live on campus and purchase a meal plan if they live more than 30 miles away from campus, and some colleges require that sophomores live on campus too. The cost of your room depends on where you live and if you have roommates, but you can expect to spend around $2,000 per semester. Meal plan prices also vary but usually come out at around $1,000 to $2,000 per semester too. As a college student, you are also responsible for paying for all the textbooks and supplies that you need for your classes. A single textbook can cost $100 or more. Many publishers now package books with codes that you need for accessing online information. As these codes are only valid once, this means that you cannot buy those books used. You’ll also need supplies that include paper, pens, highlighters and a book bag, and some students may need specialty supplies like calculators, computer software and clothing. How Do Students Pay for College? After looking at the average price of tuition at a private university, you may wonder how students can afford to attend college today. 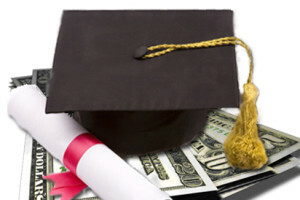 Most students require some form of financial aid from the college they attend. Students typically obtain loans from the government that they pay off after leaving school, but those who need more aid may receive grants or take part in work study programs on campus. Many colleges also have scholarships available for incoming students. Though some think scholarships are only open to those who receive high grades or have high standardized test scores, there are also scholarships designed for those who enroll in certain programs or meet specific requirements. When you factor in the cost of textbooks, supplies and room and board, you might find that college costs $10,000 or more than what you expected. Though the average price of tuition at a private university is now more than $30,000 a year, you can get financial aid that helps bring down your tuition costs.